Visit us for the perfect mix of club culture & sensual entertainment within a premium venue, with excellent hospitality delivered by our outstanding team and our gorgeous Angels. Providing an incredible hospitality experience is what we do best! CELEBRATING A SPECIAL OCCASION OR JUST GOING LARGE? Check out OUR vip packages below! If you are looking for somewhere to host an amazing event look no further, we successfully host corporate parties/daytime hire/stag do’s/birthday parties or simply a good old night out. Please use our bookings and enquiries form to allow us to take the hassle out of your event planning. We offer a variety of packages to suit your needs. Pay and Display outside venue. Once you are inside the Casino Rooms, entry to Tenshi is FREE. Prior to entry to Tenshi, you will be explained the rules of the venue by one of our friendly security staff. Once inside Tenshi, you are under NO OBLIGATION to buy a drink or have a dance with one of our Angels (Dancers). We are very proud of the presentation and cosmetic of Tenshi and are more than happy for you just to pop in for a look and see what we are about. When you are ready to buy a drink in Tenshi, one of our friendly bar team will be happy to serve you. We have an extensive range of products, ranging from familiar standard brands at very reasonable prices, right up to Ultra Premiums and even some very rare specialities! Our friendly Angels may come to talk to you, so don’t be shy. If you would like a private dance, they will be happy to take you to the pay desk. Single dances are £20. If you would like a VIP Table or would like to book a particular Angel, please speak to our manager at the pay desk who will be happy to help. 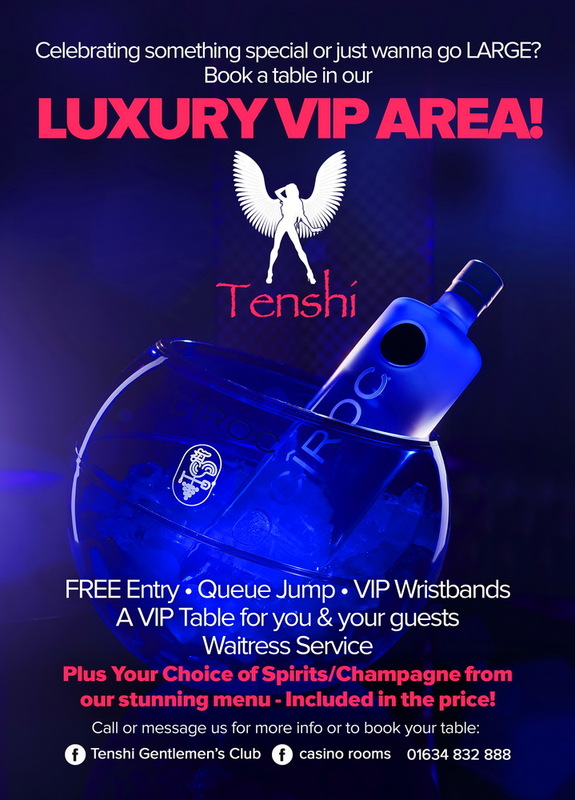 If you wish to leave Tenshi and visit the Nightclub (which is in the same building), you are free to do so at any time. You can come and go as you wish, but please bare in mind that you may need to be told the rules again each time you come back into Tenshi. Please also note that we do not allow drinks to leave Tenshi or to be brought into it from the Nightclub. Not available in the UK until later this year, but we have some! Thank you Conor! Come try it at Tenshi Gentlemen’s Club before anyone else! Fancy trying a new, rewarding and unique line of work? Then why not audition for us at Tenshi Rochester? HUGE earning potential in a safe working enviroment. To apply you must me over 18 with a Valid EU Passport or FULL UK Drivers Licence and proof of address. Please complete your details on this page and one of our management not team will get in touch with you. What is the dress code at Tenshi Gentlemen's Club? Dress Code: No Effort - No Entry. Can I pay by card at Tenshi? Cashback is also available at any bar within the building. How do I apply for work at Tenshi? to collect an item from the cloakroom at the end of the night? Feel free to drop us a line with any requirements you may have. We cater for large parties for any occasion.